*The share price is the closing price on June 1. The number of shares issued, ROE, and BPS were the values for the previous term. *The forecast is from the company. From the term ended Mar. 2016, the IFRS has been used. The amounts in the term ended Mar. 2015 are those after the IFRS adjustment. From the term ended Mar. 2016, net income is profit attributable to owners of the parent. *The company conducted 1-for-10 reverse share split on Oct. 1, 2017. DPS for the term ending Mar. 2018 represent the amounts taking the 1-for-10 reverse split into account. EPS and DPS are not adjusted. This report outlines the financial results of KYB for the term ended Mar. 2018 and interview with President Nakajima, etc. The largest manufacturer of independent hydraulic equipment in Japan. Based on hydraulic technology, the company offers products and technologies in a wide range of fields such as "automobiles", "motorcycles", "construction machinery", "industrial vehicles", "aircraft", "railroads" and "special purpose vehicles". KYB has a high market share with many products. For instance, shock absorbers for automobiles account for 46% of the domestic market and 14% of the global market. The roots come from "Kayaba Research Center", which was established by Shiro Kayaba, who is an inventor and a founder, in November 1919. In January 1927, a self-employed enterprise, Kayaba Seisakusho, was established for manufacturing hydraulic dampers, catapults, etc. for aircraft. In March 1935, Kayaba Manufacturing Co., Ltd. was established. After the end of World War II, in June 1956, Kayaba Auto Service Co., Ltd. was established for offering products and services. In October 1959, company's stocks were listed on the Tokyo Stock Exchange. In July 1974, KYB Corporation of America was established in the United States in order to enter the North American commercial market. Then, the company actively entered foreign markets such as Asia and Europe. In October 1985, the company name "Kayaba" was changed from kanji (Chinese characters) to katakana (Japanese Characters). In October 2015, the trade name was changed from Kayaba Manufacturing Co., Ltd. to KYB Corporation in order to further strengthen the brand image. As they changed the corporate name from "Kayaba Manufacturing Co., Ltd." to "KYB Corporation" in 2015, they aim to popularize the KYB brand on a global basis. Therefore, as shown below, the logo "KYB" has the meaning and spirit. Slanted slits in each letter represent comfortable sunlight cast through the trees and sunbeams illuminating the road ahead. The logo represents an image of unconstrained growth and flexible response to the trends of the era. The right side of the letter "B" represents liquid pressure indicating the origin of KYB. Using italic letters expresses a sense of speedy movement, progressiveness, growth potential, innovativeness. Red represents enthusiasm to create a society where industrial crafting brings happiness to everyone and to provide the technologies that bring a warm and comfortable life. KYB names this red "KYB Red" as the corporate color. The characteristics of products such as precise quality and reliable technology are expressed with the statement. It means that not only providing reliable quality to general consumers and business partners leads to stakeholders' "advantage (superiority)", but also the joy of manufacturing, which enables each employee to realize that they can change the world with sure quality, becomes "advantage (merit)". As a KYB group that contributes to society by providing technologies and products that make people's lives safe and comfortable, they have the following management philosophy and management vision. The automobile market and the construction machinery market have a great effect on KYB's performance. KYB recognizes the current and future situations of the two markets as follows. The global demand for automobiles is expected to increase slightly, driven by emerging countries such as Southeast Asia. Domestic car sales are expected to see a certain amount of demand, but the impact of negotiations for eliminating trade deficit with the United States is unpredictable. The commercial market is expected to expand mainly in emerging countries. KYB supplies shock absorbers (SA) for new vehicles directly to automobile manufacturers as Tier 1, and also supplies them to auto parts stores, repair shops, etc. through agencies for aftermarket as well. The company calls the former "OEM" and the latter "marketed". Japanese cars are popular in Asia, the Middle East and others, and the commercial market is important for KYB. The Chinese market is booming, as the demand for infrastructure and its renewal is growing nationwide. In the European and U.S. markets, the demand for small-sized excavators as urban construction machinery is strong. The Indian market is growing, thanks to the active investment in infrastructure. The company expects that the demand for excavators weighing 6 tons or more will remain strong and the market of excavators weighing less than 6 tons will keep growing healthily. KYB's domestic competitors include Showa Corporation (7274, TSE 1st section), 33.4% of whose shares are held by Honda, and Hitachi Automotive Systems, Ltd. (unlisted), a group company of Hitachi. Its global competitors consist of ZF in Germany, Tenneco in the U.S., and so on. ZF has a long history and intimate relationships with European automobile manufacturers. The company's share in the commercial product market is slightly less than 20%. Tokico (which was acquired through M&A by Hitachi and is unlisted; today it is one of the brands of Hitachi Automotive Systems) and Monroe (a commercial brand of Tenneco) have earned a large market share in Japan and globally, respectively. KYB competes with Showa, which is closely related to Honda, in the market of shock absorbers for motorcycles, and with JTEKT Corporation (6473, TSE 1st section) and NSK Ltd. (6471, TSE 1st section) in the steering market. In the market of cylinders, which are the parts with the highest sales ratio in KYB, Chinese manufacturers and the like are extending their influences. KYB's competitors include Nabtesco (6268, TSE 1st section) in the market of control valves for which KYB has the advanced technology, and Nabtesco and Nachi-Fujikoshi (6474, TSE 1st section) in the market of travel motors. In addition, the largest construction machinery manufacturer in Japan manufactures a number of parts internally. KYB's business segments are composed of the following three segments: the "AC Business" consisting of hydraulic shock absorbers for automobiles and motorcycles, power steering, etc., the "HC Business" including hydraulic equipment for industrial use mainly for construction machinery, and the "Others" segment which handles special purpose vehicles such as concrete mixer trucks, aircraft components, system products, electronics, and the like. This segment consists of shock absorbers for automobiles and motorcycles, hydraulic equipment for automobiles, and other products. A shock absorber is a device that absorbs vibration of the car body, being mounted between the body and the tires together with a spring. Each automobile is equipped with a "suspension" which is the system that improves riding comfort and operational stability. Suspensions have two main functions; one is, as buffers, to prevent transmission of rough road profiles to the car body and another is to set the position of the wheels and axles and press the wheels down on the roads. Basically, a suspension is composed of a suspension arm which fixes the wheel position, a spring which supports the car weight and absorbs vibration, and a shock absorber (damper) which dampens vibration of the spring. Automobiles absorb shock caused by uneven road profiles by contracting the springs, but due to their characteristics, the springs rebound to get back to their original position after the contraction. The top of a spring is connected to the car body and the bottom is coupled with a suspension that includes the heavy tires and brake, which results in, due to inertia, repetition of expansion and contraction of a spring in a range wider than one necessary for returning to its original position. The force that controls expansion and contraction of springs and reduce vibration is called "damping force." The "hydraulic technology," which KYB has cultivated and improved since its inauguration, plays a significant role in generating "damping force." The tube of a shock absorber contains oil with a piston moving in it. A piston has holes through which oil passes when the piston moves following vibration, and the resistance of the oil generates "damping force." In addition, the moving speed of pistons varies with the degree and velocity of vibration from the car body, and the faster a piston moves, the larger "damping force" becomes. This is called "damping force characteristics." KYB's shock absorbers developed based on its sophisticated technology has earned reputation from a number of automobile manufacturers worldwide, leading to the large market share as mentioned below. Furthermore, it is said that shock absorbers usually need to be replaced after 5 years from the date of first registration or when the travel distance reached 100,000 km as they deteriorate due to various factors including travel distance and lapse of time and the function decreases. This replacement demand, which in other words is the commercial product market, is one of the greatest business opportunities for the company. It is the steering system that provides "the function of taking curves," one of the three basic functions of automobiles including "driving," "taking curves," and "stopping." KYB's steering components include the "hydraulic power steering (PS)" that uses the hydraulic power assist unit to support turning of the steering wheel done by drivers and steer the tires, and the "electric power steering (EPS)" that uses the electric power assist unit composed of a motor, a controller, a torque sensor, etc. to support turning of the steering wheel and steer the tires. The "PS" enables steering operation by a mere movement thanks to hydraulic force and is an indispensable component for safe driving because of its ability to expeditiously avert risks, whereas the "EPS" whose power source is a battery improves fuel efficiency compared to the "PS" whose power source is the engine of a car. Suspensions minimize shock to the car body regardless of road surface conditions, pursuing comfort. The company's RCUs boost riding comfort by maintaining the posture of vehicles and absorbing vibration and shock from the road surfaces. The HC Business consists of hydraulic equipment for industrial use and other products. The mechanism of the drive system of construction machinery such as shovels consists of various parts as shown below, including control valves, piston pumps, travel motors, swing motors, and cylinders; it is the control valve, which is the "brain" of construction machinery, that controls a variety of actuators (a drive unit which converts energy to translational or rotary motion through hydraulic pressure and electric motors) to enable smooth movement of driving, turning, and bending and stretching of the arms. KYB's control valves have realized more advanced control by combining electric control with its special hydraulic technology. In addition, KYB is one of the few manufacturers that manufacture all of the above-mentioned parts. KYB's competitive edge is that it can make suggestion to construction machinery manufacturers because it manufacturers all kinds of parts as just mentioned. The other businesses are composed of special purpose vehicles, hydraulic equipment for aircraft, system products, electronics, and such. KYB's concrete mixer trucks have high mixing and emission performance, accounting for about 85% of the domestic market share. It offers highly-reliable products for aircraft, including various actuators, weight-saving accumulators, and wheel brakes. In addition, KYB has the largest market share in the Japanese market of seismic isolation systems and earthquake dampers to which its unique hydraulic technology has been applied. The following is a list of KYB's major clients. Its shock absorbers are mounted on about 60% of automobiles manufactured by Toyota globally. They are also adopted to about 30% and about 10% of automobiles manufactured by Nissan and Honda, respectively, contributing to KYB's large market share. As previously mentioned, KYB supplies its shock absorbers through 2 sales channels including the OEM production system for new vehicles and sale on the market for used vehicles. Although sales of OEM products are higher, its commercially-available products sold as its private brand show great profitability and thus the company will expand the business to the global markets. KYB's commercially-available shock absorbers can be mounted on about 90% of Japanese, American, and European automobiles used worldwide today. What is behind such a high coverage rate is the strong relationships KYB has with major automobile manufacturers including Toyota. In 24 countries worldwide including Japan, KYB has 48 group companies, establishing strong global networks. KYB has established a global and optimum research and development (R&D) structure by setting R&D bases in 5 regions including Japan, North America, Europe, China, and Thailand. While the R&D bases in regions other than Japan basically engage in development of model products and development for enhancing product appeal such as performance improvement and cost reduction, R&D from the long-term perspectives are carried out mainly in Basic Technology R&D Center (Sagamihara-shi, Kanagawa) and Production Technology R&D Center (Kani-shi, Gifu) in Japan and R&D of highly unique prior art, etc are performed. In addition, the know-how about production equipment designing which has been cultivated in Production Technology R&D Center and each plant is gathered in Machine Tools Center (Kani-shi, Gifu) in order to strengthen and propel internal manufacturing of equipment, jigs, and tools for which KYB has strived to boost innovative spirit and reliability. In Electronics Technology Center (Sagamihara-shi, Kanagawa), a system that collects technologies for designing and evaluating electronics, increases development capabilities, and conducts a series of processes ranging from product development to prototype evaluation and mass production in a smooth and prompt manner has been established. Regarding high-functionality and systematization of its products, KYB, in addition to independent development, propels joint research and development with its clients or related equipment manufacturers. The company is also endeavoring proactively to developing advanced technology through industry-academia collaboration. Since the term ended Mar. 2013, the company has raised its awareness about the ratio of R&D expenses to sales, maintaining the ratio at about 2%. KYB is propelling the development of products by dealing with performance improvement, high functionality, and systematization and considering eco-friendliness with respect to energy and environmental issues through weight saving, energy saving, reduction in environmentally hazardous substances. At the same time, it is striving to strengthen its production technology capabilities. In addition, following the accelerated globalization, it aims to set up a strategic and global production, sales, and technological structure, including development of human resources with global outlooks and establishment of a standardized management system. Lately, the company has focused on product development related to autonomous driving systems. One example is the technology that integrates EPS (electronic steering) and shock absorbers. KYB considers that the technology, which enables more comfortable and smoother driving in any road surface conditions independently of the drivers' skills and judgment, is definitely indispensable for automobiles with the autonomous driving system. Furthermore, KYB deems the "steering by wire" system is another technology whose importance will grow in the future. In the conventional steering operation, movement is transmitted to the steering gear box and tires through the steering shaft, whereas the "steering by wire" system conveys steering movement via electronic signals. Some of the system's advantages include the capability of relieving drivers' fatigue due to less vibration from the tires, and the capability of automatically adjusting sideslips of the car body due to strong winds which conventionally needed to be adjusted through an intentional steering operation by drivers. In addition, thanks to the "steering by wire" system, the steering wheel may not necessarily be mounted on the right front of a car, and therefore, the system's potential for considerably changing the way automobiles are, including the design and functions, has attracted much attention. Although several issues still exist, KYB is further brushing up the system as its unique EPS technology. KYB has earned a large market share of multifarious products, with the domestic share of OEM shock absorbers for automobiles being 46% and its global share being 14%, the global share of hydraulic cylinders for construction machinery being 30%, the domestic share of concrete mixer trucks being 85%, and the domestic share of earthquake dampers and the seismic isolation system being 45%. Such large market shares are attributed to the great trust in its products from clients as indicated by the fact that KYB has about 60% share on a global basis in Toyota Motor which vies with Volkswagen and GM for the position of the world's largest automobile manufacturer. The basis of the clients' trust is nothing else but the superior "hydraulic" technology that KYB has cultivated and enhanced for the past 100 years since its foundation. 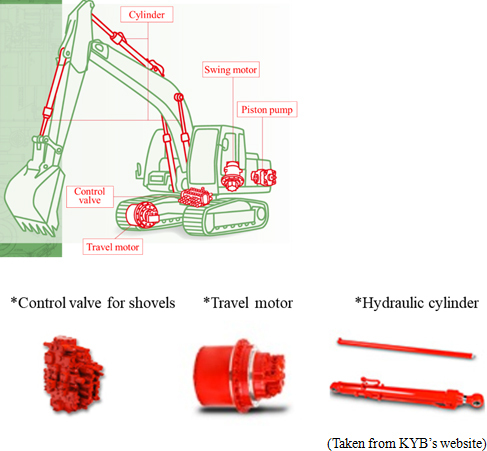 KYB's two core technologies, the "vibration control technology" represented by its shock absorbers and hydraulic earthquake dampers and the "power control technology" typified by its control valves for shovels and electric power steering, have gained high reputation from clients and thus are used in diverse circumstances. Aiming for a consolidated payout ratio of 30% or higher, it decided that dividends shall be distributed basically at the annual DOE of 2% or higher.This means that dividends will be paid stably at DOE of 2% when the business performance is sluggish, whereas shareholder return will be made depending on profit when the business performance is healthy. KYB' target ROE for the term ending Mar. 2020 is 10%. Given that, for the term ending Mar. 2019, the total asset turnover and leverage are unchanged and the forecasted net income margin is 4.0%, ROE for this term will be 9.1%, which means increasing profitability is needed to achieve the target. HC business showed favorable performance, resulting in increase in sales and profit. Significantly exceeded the initial estimates. Sales were 392.4 billion yen, up 10.4% year on year. The sales from the AC and HC businesses grew. Especially, the sales of the HC business increased about 20%, as the Chinese construction machinery market thrived. The segment income rose 16.0% year on year to 21.6 billion yen. Operating income grew 8.5% year on year to 20.9 billion yen. Taking into account the cost for the cancellation of the joint venture of equity-method affiliates, etc., the company downwardly revised operating profit and profit before taxes in Feb. 2018. Both sales and profit exceeded the respective initial estimates considerably, but profit did not reach the revised estimate, because the sales volume in the North American market dropped in the 4th quarter. The sales of shock absorbers for automobiles and motorcycles grew steadily in Europe, etc., but profit declined due to the augmentation of personnel expenses, etc. The demand for construction machinery in China remained strong. Personnel expenses augmented, but it was offset by sales growth, allowing profit to increase. While sales increased in China, where the construction machinery market is thriving, and Europe, where the products for automobiles sold well, the sales of products for automobiles were sluggish in the U.S. The ratio of overseas sales rose from 53.5% to 54.5%. Current assets grew 30.6 billion yen from the end of the previous term, due to the increase in cash, trade receivables, etc. Noncurrent assets were nearly unchanged, as property, plant and equipment increased, but deferred tax assets decreased. Total assets rose 31.2 billion yen to 412.5 billion yen. Current liabilities augmented 24 billion yen from the end of the previous term, due to the increase in trade payables, etc. Noncurrent liabilities decreased 9.7 billion yen due to the shrinkage of debts, etc., and total liabilities augmented 14.3 billion yen to 225.8 billion yen. Total capital increased 16.9 billion yen to 186.7 billion yen, due to the rise in retained earnings, etc. As a result, the ratio of equity attributable to owners of parent rose 0.6 points from 43.1% at the end of the previous term to 43.7%. The surplus of operating CF shrank, due to the increase in trade receivables, inventory assets, etc. The deficit of investing CF decreased. The surplus of free CF increased. The deficit of financing CF augmented, due to the increase of payment of dividends, etc. The cash position improved. Sales and profit are estimated to grow. Sales are projected to rise 5.8% year on year to 415 billion yen. It is expected that the construction machinery market will thrive this term, too, and the growth of sales volume of shock absorbers for automobiles will contribute. The segment profit is projected to rise 1.9% year on year to 22 billion yen, while operating profit is forecasted to increase 14.4% year on year to 23.9 billion yen. The increase in profit will be slight, because of the augmentation of fixed cost. The assumed exchange rates are 1 US dollar = 105 yen for this fiscal year (1 US dollar = 110.85 yen for the previous year), and 1 euro = 128 yen for this fiscal year (1 euro = 129.70 yen for the previous fiscal year). The annual dividend amount is to be 150 yen/share, unchanged from the previous term. The estimated payout ratio is 23.1%. The AC business is expected to recover in the U.S. From this term, the sales and cost at business establishments in Brazil will be included in consolidated results, and exchange rates will decrease profit. Then, the increase in profit is estimated to be slight. The sales of the HC business are projected to grow thanks to the strong demand for construction machinery, but profit is estimated to drop due to the augmentation of personnel expenses caused by the demand growth and the increase of fixed costs caused by a production ramp-up. The company will continue investments for innovative manufacturing and establishing an optimal production system. The equipment investment amount in the term ended Mar. 2018 was 18.49 billion yen, slightly smaller than the estimate: 19.6 billion yen. On the other hand, depreciation was 16.99 billion yen, larger than the estimate: 16 billion yen. While the goal for the term ending Mar. 2020, which was announced in May 2017, is to achieve "sales of 398 billion yen and a segment profit of 26 billion yen," the sales and segment profit for the term ending Mar. 2019 are estimated to be "415 billion yen and 22 billion yen, respectively." In the favorable construction machinery market, sales are projected to reach the target earlier than expected. The company recognizes that the company has to solve some problems in order to achieve "an ROE of 10.0% and a segment profit ratio of 6.5%." As the company strives to "achieve sustainable growth," "stabilize the revenue base," and "solve managerial challenge," and aims to achieve sales of 500 billion yen in the corporate group and get rated as A as soon as possible from fiscal year 2020, its activities in each business are as follows. As for the EPS Business, in regard with the production line, it was limited to domestic factories, and product supply to global bases that covers customers' needs was not handled well enough. On the other hand, in the enormous market of China, in addition to manufacturers from Europe and the U.S., the presence of local manufacturers has been rising, but local manufacturers are shifting from hydraulic to electrically controlled models. As such, in order for EPS to establish a global supply system and enter the expanding Chinese market, the company signed a Business Alliance Agreement with the largest Chinese local manufacturer of EPS, Hubei Henglong Automotive System Group Co., Ltd to develop, manufacture, and supply EPS products. The investment ratio is 33.4% for KYB and 66.6% for Hubei Henglong. It plans to start business operations in June 2018, and to start manufacturing in September 2018. The company will be in charge of development and production technologies management, while Hubei Henglong will be in charge of sales. In the short term, the company aims to achieve expansion of the EPS market in China, Expand ESP products line-up, utilize Chinese components to reduce production costs in Japan. As for the medium to long term, it aims to expand from the Chinese market to global market. Also, by utilizing the various resources both companies have to its maximum potential, it plans to promote EPS sales in the Chinese market, and also continue to develop products aimed at ecologically friendly cars (EV, PHV, FCV) market and products for autonomous driving technology. Additionally, it will expedite the restructuring of motorcycle business, and strengthen self-manufacturing in India. The company is working on integrating global specifications of Shock absorbers (SA) to be mass production-friendly, improving productivity through innovative manufacturing, and improving precision of order process by utilizing big data. Regarding improving productivity through innovative manufacturing, as personnel expenses rise in emerging countries, the company thinks that establishing a manufacturing system that doesn't rely on manpower is indispensable. Therefore, the company will proceed with establishing a production line utilizing IoT and AI, and improve product quality at the same time to realize the plan of achieving full automated operation by 2026. Moreover, the company is developing new-generation Shock Absorbers to satisfy the customer's demands of performance and cost at the same time. In performance-focused product development, it endeavors to achieve high-performance with low cost by integrating high-spec components and technical specifications, and aims to reduce item numbers by 30% and cut costs by 20%. In April 2018 the Europe Technical Center (Germany, Munich) commenced operations, and the company will continue developing high added-value products for the future and promote sales. As part of its medium term policy, the company aims at "securing a stable sales and profit that is not affected by market fluctuations." and while taking the excavator as a base, the company will strengthen sales promotion in growth markets where it didn't achieve enough results. Regarding accomplishing drastic structural reforms, the company is improving efficiency and productivity thanks to the transfer of Control Valve production line for medium to large models, and motor products aggregation in Sagami factory is improving efficiency. As for stabilizing its revenue base, the company has been accelerating investment to reinforce production lines to establish production/supply infrastructure that can handle high demand, reinforcing production capacity with additional investment, re-operating suspended lines, acquiring clients' capabilities and support, and expanding suppliers, etc. Additionally, as introduced in the previous report, the company has been focusing efforts on expansive sales promotion activities in growing markets in which it didn't achieve enough results. While the more than 6t excavator is susceptible to huge demand fluctuations, the North American market accounts for 80% of global market of vehicles like skid steer loaders (SSLs) and compact track loaders (CTLs) which are used for a wide variety of purposes such as architecture, road construction, agriculture and forestry, and landscape gardening, the demand for such vehicles is steadily increasing in comparison with housing starts. However, the company has yet to achieve enough results. By promoting sales to Japanese manufacturers, expanding in the North American market with the next model change in mind, developing the Compact Wheel Loader which is similar in specification, the company plans to expand market shares. * Automotive manufacturers' efforts and the spread of battery-driven EV (electric automobile) along with autonomous driving. According to various reports, the less than 1% current penetration rate of battery-driven EV is expected to reach 10% in 2030, and significantly rise to 86% in 2050. 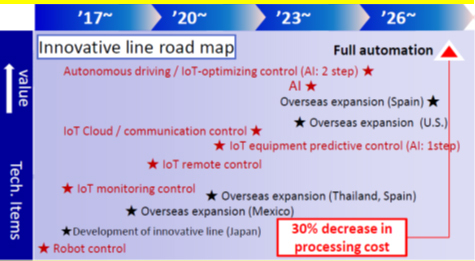 Also, regarding autonomous driving system, vehicles with level 3 (conditional automation) and level 4 (high automation) in the new vehicle market will enlarge to 20 million units by 2030. The appearance of level 5 (complete automation) will be in and after 2030. For electric automobiles, by integrating the battery in the under body, its center of gravity can be lowered, thus improving driving stability as well as allowing for a wider in-vehicle space. Furthermore, self-driving cars will provide a more comfortable in-vehicle space by freeing the driver from manual control. As a result, all automotive manufacturers give various examples of "expanding in-vehicle space" as vehicle concepts and contribute with numerous ideas in Motorshow. KYB views applying its technologies and know-how to add comfortability to the riding experience and achieve a superior quality "comfort" as its solution to "expanding in-vehicle space." That is, aspiring to achieve optimum "comfort" by providing a safe, secure, and comfortable experience through "ultimate suspension that doesn't let the passenger feel the movement," "controlling horizontal acceleration with vehicle dynamics," and "a suspension layout that allows for maximum in-vehicle space," all of which adds new functions to be expected from cars like the ability to write, read, and not get car sickness, in addition to basic functions like running, turning, and stopping. To achieve that, the company will focus the developments to achieve integration of suspension and steering system in 2030, by implementing a space-saving suspension module, elimination of the steering rack shaft thanks to right and left independent steering system, and achieving synergy between suspension and steering. The ratio of installation of electronically controlled suspensions is now 5%, and is estimated to increase to 18% in 2032. The company plans to polish its two core technologies for "vibration control" and "power control," and actively cultivate new markets after the advent of EVs and autonomous driving systems. We asked Mr. Nakajima, Representative Director and President, about the current situation and the measures he has for the future. Q. Please tell us about the environment and counter measures for both businesses. A. As for the AC business, the automobile production output has been strong globally, but various changes are happening, and the need to meticulously address such changes is increasing more and more. As for the HC business, the performance is favorable, however, it remains true that it's very difficult to avoid major demand fluctuations, therefore we need to act with various scenarios in mind. (AC Business) The automobile production output has been strong globally, but as for models, the momentum is shifting from Sedan to SUV (sport utility vehicles, multi-purpose sport vehicles). Also, as for by region, aside from that even among emerging countries European manufacturers are aggressively expanding business, especially in Africa, various changes are happening, such as the emerging of new players like EV and autonomous driving, and the need to meticulously address such changes is increasing more and more. Performance in the Chinese market is favorable, and replacement demand is arising. Our company's production is operating almost at full capacity, while the customers require solutions with the pre-assumption that this condition will continue to at least 2020. However, it remains true that it's very difficult to avoid major demand fluctuations, therefore we need to act with various scenarios in mind. Particularly, expansive sales promotion activities in growing markets in which we didn't achieve enough results is important. While the more than 6t excavator is susceptible to huge demand fluctuations, the demand for vehicles like skid steer loaders (SSLs) and compact track loaders (CTLs) is steadily increasing. However, we have yet to achieve enough results. By using strategies like sales promotion to Japanese manufacturers, we plan to expand market shares. Q. Please talk about points regarding automobile solutions' plans from 2030 from a long term viewpoint. A. By upgrading our manufacturing technology for reducing weight and polishing up the 2 core technologies for "vibration control" and "power control," we will establish our predominance in the newly emerging markets. As EV and autonomous driving become mainstream, "the expansion of in-vehicle space" and "comfortability" are under demand. Our vibration control technology will play a major role, but as automobile manufacturers demand, we need to incorporate the electronic control technology, and work actively on weight reduction. Upgrading the manufacturing technology by using alloys of aluminum and resin instead of using only conventional iron will be indispensable. By further polishing up the 2 core technologies for "vibration control" and "power control," looking ahead to 2030 we will finalize the chassis integration system and establish our predominance in the newly emerging markets of EV and autonomous driving. Q. In the previous interview, you mentioned that the problem is that you have not earned enough, that is, you made a heavy investment, but there remain many business establishments with insufficient profitability. What is the current situation? A. It's sad to say that it's still underway. Application of IoT and AI will be essential to achieve profitability. While aiming for full-automation by 2026, we will proceed with our road map for innovative manufacturing lines steadily. It's sad to say that it's still underway. As there has been a rise in personnel expenses, it's difficult to achieve profitability without considering the staffing in the production process. Application of IoT and AI will be essential here. Aiming for full-automation by 2026, we will cut processing costs by 30%, and proceed with the roadmap for innovative manufacturing lines steadily. Q. Lastly, please give messages to shareholders and investors. A. As for profitability enhancements the shareholders and investors expect, we hope to live up to their expectations by evolving technologies we have been accumulating even more, and solving problems. Also, we would like to become a company that can contribute to society and is demanded by society, and I hope they continue medium/long term support. I fully understand that shareholders and investors have expectations for our company to enhance profitability. To enhance profitability, we will make every possible effort to establish an efficient manufacturing system, increase added value, and give proposals with competitive advantages to customers, based on our "vibration control technology." There are many problems to be solved, but by evolving the technologies we have been accumulating, we will solve them and live up to their expectations. Also, 80 years' worth of accumulated technologies is our main point of strength, with which I would like to contribute to society by being a significant part of corporations that society demands, and I hope they will continue medium/long term support. While the goal for the term ending Mar. 2020 set in the mid-term management plan is to achieve "sales of 398 billion yen," the sales for the term ending Mar. 2019 are estimated to be "415 billion yen." In the favorable construction machinery market, sales are projected to reach the target earlier than expected, but its share price is stagnant. As recognized by the company, this is because the company delayed in attaining the target profitability: "an ROE of 10.0% and a segment profit ratio of 6.5%." We would like to pay attention to their efforts for improving profitability and results. KYB has formulated a 3-year mid-term management plan with the year 2017 (the term ending Mar. 2018) being the first fiscal year and the year 2019 (the term ending Mar. 2020) being the final fiscal year and the plan is ongoing. Under the slogan of "A GLOBAL KYB - CHALLENGE & INNOVATION -," KYB is striving to "complete drastic structural reform" in FY2017 and will make efforts to realize "sustainable growth," "stabilization of the earning base," and "solving managerial issues" in FY2018 and 2019. The company will aim to achieve sales of 500 billion yen in the group companies as a whole and earn the rating "A" as soon as possible after fiscal 2020. KYB aims to increase the number of shock absorbers sold to 88 million (OEM products and commercially-available products account for 68% and 32%, respectively) for fiscal 2020 from 72 million (OEM products and commercially-available products account for 70% and 30%, respectively) in the previous term. In order to respond to the expectations of the stakeholders through realization of sustainable growth and corporate value improvement as well as fulfill the corporate social responsibility of contributing to society, it is our basic approach to pursue the development of a rapid and efficient management structure centered on the Board of Directors and establishment of fair and transparent management supervision functions and work on strengthening and enhancing corporate governance based on the following management philosophy and basic policies. "KYB group contributes to the society, by serving technologies and products that make people's life safe and comfortable." 1. We shall build a corporate culture that holds high goals and full of vitality. 2. We shall maintain kindness and sincerity, cherish nature and care for the environment. 3. We shall constantly pursue creativity and contribute to the prosperity of customers, shareholders, business partners and society. 1. We shall respect the rights of shareholders and ensure their equality. 2. We shall take the benefits of stakeholders including our shareholders into consideration and endeavor to appropriately collaborate with those stakeholders. 3. We shall disclose not only the information in compliance with the relevant laws and regulations, but also actively provide the important and/or useful information to the stakeholders for their well-informed decision making. 4. The Board of Directors shall be aware of its fiduciary responsibility and accountability to the shareholders and shall appropriately fulfill its roles and responsibilities in order to promote sustainable and stable corporate growth and increase corporate value, profitability and capital efficiency. 5. We shall engage in constructive dialogue with the shareholders and make efforts to obtain their support regarding the company's business policies and also reflect their opinions in the improvement of management. This report is intended solely for information purposes, and is not intended as a solicitation to invest in the shares of this company. The information and opinions contained within this report are based on data made publicly available by the Company, and comes from sources that we judge to be reliable. However we cannot guarantee the accuracy or completeness of the data. This report is not a guarantee of the accuracy, completeness or validity of said information and or opinions, nor do we bear any responsibility for the same. All rights pertaining to this report belong to Investment Bridge Co., Ltd., which may change the contents thereof at any time without prior notice. All investment decisions are the responsibility of the individual and should be made only after proper consideration. Copyright(C) 2018, All Rights Reserved by Investment Bridge Co., Ltd.